Retired Auxiliary Bishop of Philadelphia Martin N. Lohmuller, 97, died Jan. 24. He was the longest serving Catholic bishop in the United States at the time of his death and the longest serving priest of the Archdiocese of Philadelphia. As Vicar General in Curia under the late Cardinal John Krol, he was the archbishop’s right hand, heavily involved in all the important events of the archdiocese. Until recently he lived in retirement at St. Cyril of Jerusalem Parish, Jamison, assisting in parish ministry until failing health curtailed his activities. Born Aug. 21, 1919, one of two sons of the late Martin and Mary (Doser) Lohmuller, he attended the former St. Henry School in North Philadelphia and went on to Northeast Catholic High School. He’d begun thinking about the priesthood in about the sixth grade. Msgr. 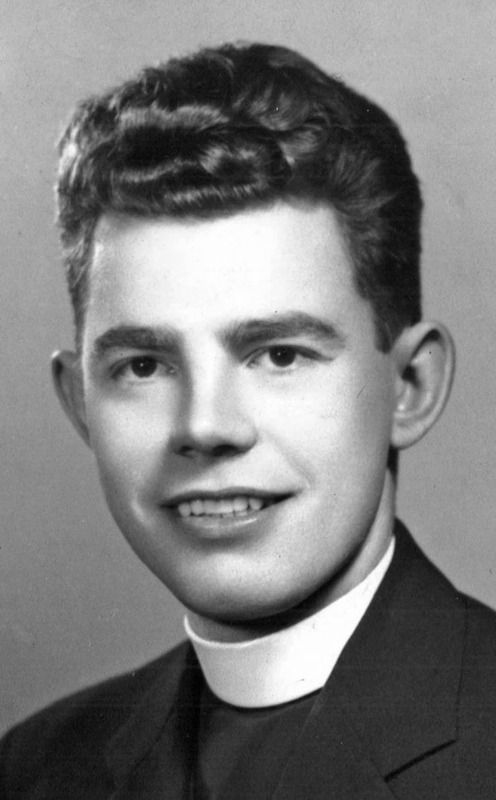 William Koenig, whose family lived a few doors away on the 4200 block of Fairhill Street, suggested he leave North after his sophomore year and enter what was then a minor seminary program at St. Charles Borromeo Seminary. “If I had to do it over again I would have stayed in high school for the four years,” Bishop Lohmuller said in a 2009 interview with The Catholic Standard and Times. When he arrived at St. Charles he was the youngest of an incredible 490 seminarians then studying for the Philadelphia Archdiocese, all now deceased. An excellent student, he was just shy of his 25th birthday when he was ordained June 3, 1944 by Bishop Hugh L. Lamb at the Cathedral of SS. Peter and Paul. He was immediately sent to the Catholic University of America in Washington, D.C., for a doctorate in canon law. After his return to Philadelphia in 1947, he taught for a year at the former St. James High School, Chester. This was followed by his temporary loan to Harrisburg where Bishop George Leech needed a canon lawyer to reorganize his tribunal. His duties turned out to be much more involved than that, and the “temporary loan” stretched to 22 years. While in the Harrisburg Diocese he was founding pastor of Our Lady of Good Counsel Parish in Marysville, and as such the first resident priest in Perry County. He also founded St. Bernadette Chapel in Duncannon, which later became a flourishing parish in its own right. “I really learned to be a priest in Harrisburg,” Bishop Lohmuller said. At the groundbreaking for the new addition to the CK Center in SPringfield, Delaware County on May 9, 1982, Bishop Lohmuller tosses the first spadeful of soil in the construction. During this period he also became a life-long friend to the future Cardinal William Keeler who worked with him as secretary of the Tribunal and assistant pastor at Our Lady of Good Counsel. His single greatest achievement during those Harrisburg years, in his own estimation, was leading the effort to establish Holy Spirit Hospital in Camp Hill. “Planning began in 1953 and it opened in 1963,” Bishop Lohmuller said. A Catholic nurse suggested the need for such a hospital and Father Lohmuller picked up the cause and suggested it to Bishop Leech. Today it is a flourishing 335-bed community hospital, affiliated with the Geisinger Health System but still under the auspices of the Sisters of Christian Charity. “Father Lohmuller was just a wonderful priest,” said Sister Romaine Niemeyer, who was associated with Holy Spirit almost from the founding years and recently stepped down from the office of President and CEO. “He was very proud of building that hospital,” said Msgr. Powell, who as pastor of St. Cyril Parish lived with Bishop Lohmuller in residence there for years. Because Harrisburg is the seat of Pennsylvania state government, it has always been a focal point for church and state dialogue. In an informal way, Father Lohmuller handled relations with the lawmakers but knew there was a need for a more organized effort. Through his urging, the Pennsylvania Catholic Conference (PCC) was founded in 1958 with William Ball as executive director. Bishop Lohmuller served the PCC in various capacities and was a member of its executive board for 25 years. Francis Viglietta, director of the Department of Social Concerns at the PCC, remembers Bishop Lohmuller as extremely well-organized, compassionate and extremely fair. Sister Clare Christi Schiefer, O.S.F., who is president of the Pennsylvania Catholic Health Association at the PCC, recalls he was always interested in health care issues, tracing back to the founding of Holy Spirit Hospital. “He always seemed to be a man of great integrity and fairness,” she said. She credits Bishop Lohmuller as a reason the PCC became a model for Catholic conferences around the country. “He would say, ‘If the staff did their job well, the conference would succeed,’” she recalls. In February 1970, out of the blue, he received an extraordinary telegram from the Holy See. It notified him that the Holy Father desired to appoint him as an auxiliary bishop for his home diocese of Philadelphia. There were coded instructions in Latin for him to wire back whether he accepted or refused the appointment. He accepted and was ordained a bishop by Cardinal John Krol at the Cathedral of SS. Peter and Paul on April 2, 1970. Working for Cardinal Krol in a position, which in corporate life would be equivalent to managing director, for the next 18 years was exhilarating for Bishop Lohmuller. “I think he was unparalleled as an administrator,” said Bishop Louis A. DeSimone, a retired auxiliary bishop of Philadelphia. 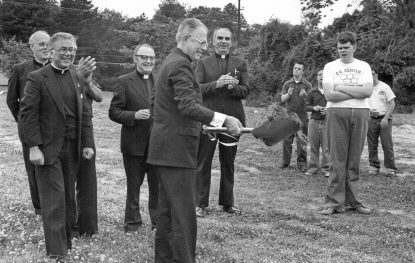 An early task was overseeing the planning and construction of the Archdiocesan Pastoral Center, a more efficient, unified building which replaced the hodgepodge of small buildings and converted houses which had served as office space for the archdiocese over the previous century. The address given to the building was 222 North 17th Street. As he told Msgr. Powell, the bishop was given the option of choosing the exact address and chose 222 because his building address in Harrisburg was 111. “I’m hoping when I get to heaven my address will be 333,” the bishop quipped. Another challenge was the International Eucharistic Congress held in Philadelphia in 1976. “We had no instructions. The cardinal said, ‘Here, do it.’ It was a marvelous experience that exceeded all expectations,” he later recalled. Three years later, there was the Mass celebrated by Pope-now-St. John Paul II on Philadelphia’s Benjamin Franklin Parkway, the largest Papal Mass in America up to that time. More modest but nevertheless satisfying accomplishments were overseeing the founding of St. Martha Manor, the first Catholic nursing home in Chester County as well as the joint pastorship of Old St. Mary and temporarily unused Holy Trinity Church. The latter, the first ethnic parish in America, was founded for German Catholics and leading it satisfied Bishop Lohmuller’s sense of his own German heritage. Also during that era Bishop Lohmuller played a significant role in the foundation of Nutritional Development Services, the food outreach ministry of the Philadelphia Archdiocese. 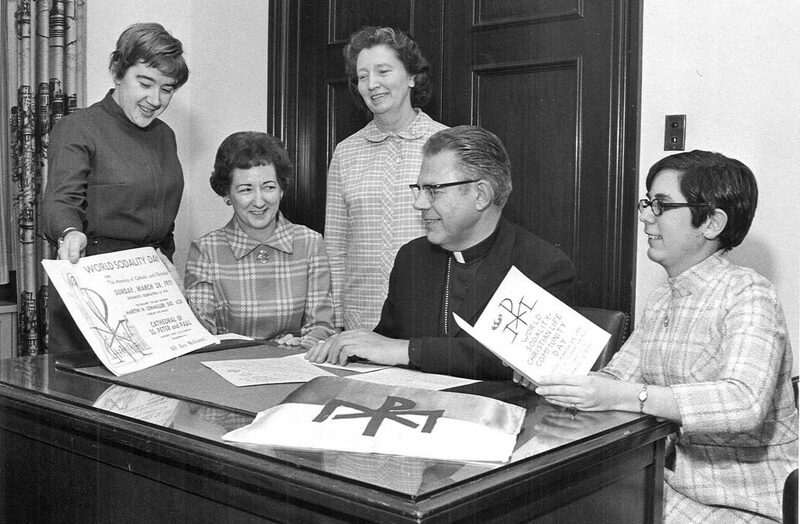 “He signed the original submission of our Articles of Incorporation in February 1973 (and) he was the chairman of the board from April 1973 until May 1989 when NDS became a division of the Secretariat for Catholic Human Services,” said Lorraine Knight, executive director of NDS today. 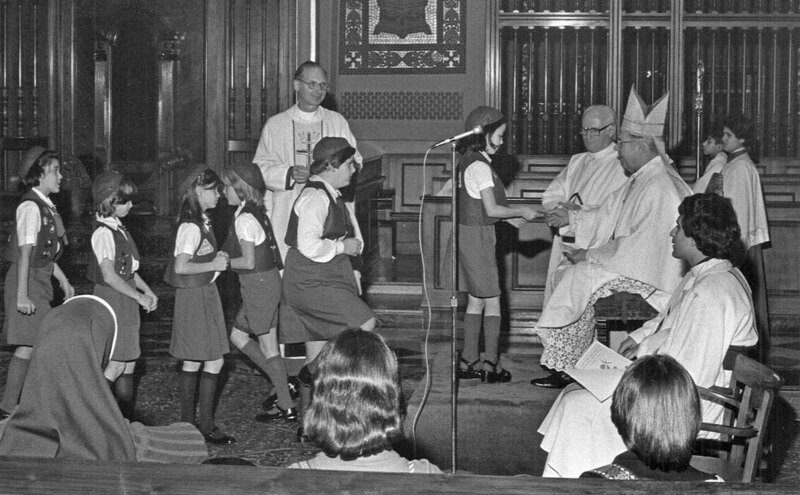 Bishop Lohmuller gives religion awards to Agape Camp Fire girls Dec. 3, 1977 at the Cathedral Basilica of SS. Peter and Paul. “Bishop Lohmuller served as an adviser to the founding director, Patrick Temple-West, for many years, encouraging the growth and expansion of the work of NDS,” she said. “He was definitely a good holy priest. It was not easy to do what he did but he did what he had to do,” Beatty said. Although Bishop Lohmuller was from a family of two children he had 10 nieces and nephews, five girls and five boys, and he had an impact on every one of their lives, according to his nephew, Dr. Joseph Lohmuller, who is a surgeon in Davenport, Iowa. Although all 10 are scattered around the Midwest, he expects all of them will attend Bishop Lohmuller’s funeral. In a way the bishop was instrumental in their parent’s meeting. “My father’s name was Herbert. My mother, who is still living and 92, is named Genevieve,” Dr. Lohmuller said. “Her mother, who was living in Chevy Chase (Maryland) while my uncle Martin was studying at Catholic University, would often invite young priests from the university to her home for a home-cooked meal. One week when she invited my Uncle Martin he told her his brother was visiting and asked if he could bring him along. My grandmother said, ‘Sure,’ and that’s where my father met my mother. Dr. Lohmuller remembers when he was himself in college his uncle was serving as chaplain of a pilgrimage to Israel and took him along. “It was fantastic,” he said. Bishop Lohmuller would often vacation at a lake house with Cardinal Keeler and Dr. Lohmuller’s three youngest sisters would be invited to join them. Bishop Lohmuller’s greatest contribution to the family was spiritual, according to his nephew. Among the many offices that reported to Bishop Lohmuller directly was the Office for Youth Activities, which was headed first by Msgr. Francis Schmidt and then Msgr. Robert Maginnis, who is himself now a retired auxiliary bishop of Philadelphia. Bishop Lohmuller officially retired in 1994 at age 75, but nevertheless kept up a busy confirmation schedule. The last 12 years of his life were spent with Msgr. Powell at St. Cyril Parish in Jamison, Bucks County. He told me, “I want to do parish work in retirement,” Msgr. Powell said. With the assistance of Cindi Tomassoni, a registered nurse, Msgr. Powell cared for the elderly bishop in his final years. “It was an honor to care for such an important person,” Tomassoni said. That’s a sentiment Msgr. Powell and many others could agree with.